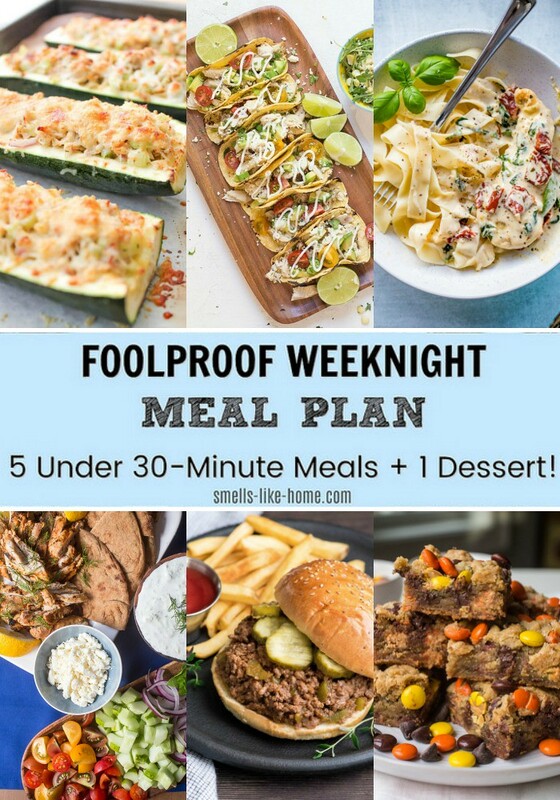 Foolproof weeknight meal plan is back on Smells Like Home! 5 30(ish) minutes meals + 1 dessert! A weekly series coming at you every Saturday! As each summer flies by, I always start scrambling to build more meals with fresh, seasonal, and local summer veggies before they disappear in the fall. 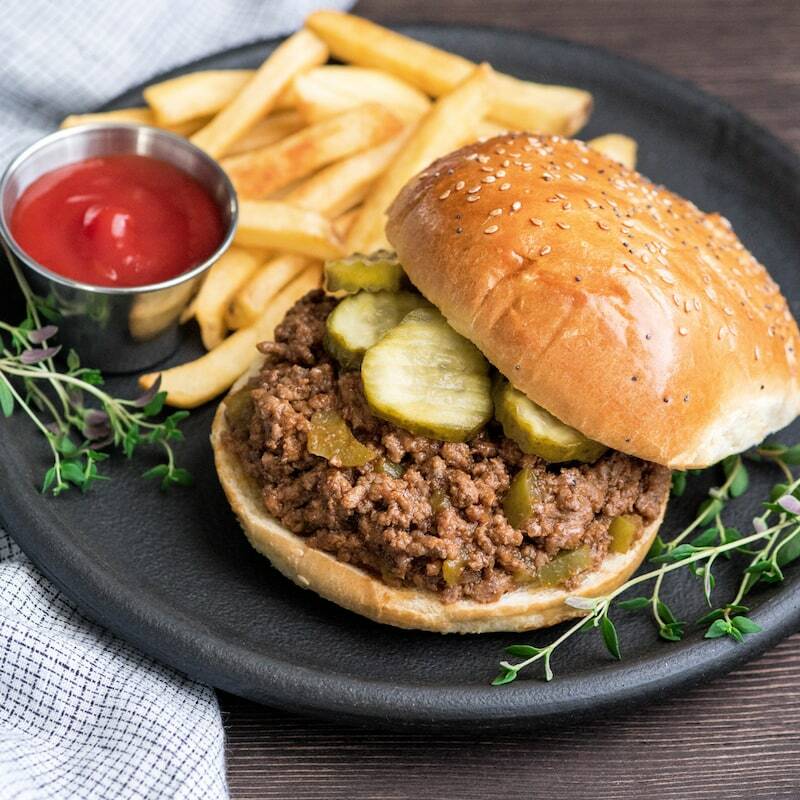 I think the meals I’ve planned out for you this week really hit on this and even the homemade sloppy joes at the end of the week can be topped with homemade garlic dill pickles (see recipe link below). I hope you’re loving all of these foolproof weeknight meal plans I’m putting together each week as much as I love doing it! I’ve found some really awesome dinners this way! Roasted zucchini tuna melts by The Honour System: If you’re in zucchini overload this time of year from your garden or CSA, this recipe is for you! 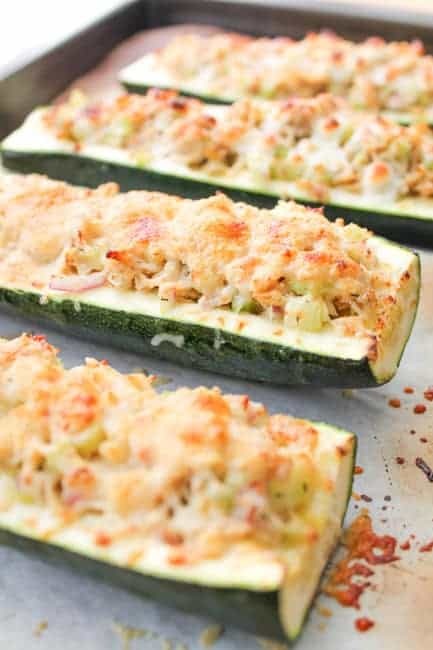 I’m all over creative ways to use zucchini and these zucchini tuna melts hit all the marks. Garlic lime chicken tacos with lime crema by Cook with Me Darling: Can I get a round of a applause for these garlic lime chicken tacos? Because, I mean, garlic lime is possibly one of my very favorite flavor combos and when it involves TACOS, I’m first in line to belly up to the counter. Prepped and cooked in about 15 minutes using a rotisserie chicken (my go-to for quick chicken meals! ), I’m confident your family is gonna love these tacos! Creamy tuscan chicken by Nourish and Fete: Aside from baking a loaf of bread from scratch, there’s almost nothing that makes me happier in the kitchen than finding new, creative, and quick ways to cook chicken breasts. Monica’s creamy tuscan chicken looks absolutely fantastic and since it’s a pantry staple sort of meal (aka, I always have the ingredients on hand) to make in under 30 minutes, I know this one will go over big in your house. Chicken gyro salad by Smells Like Home (hai! ): This chicken gyro salad has been one of our absolute favorite meals over the past 2 years. Easy to make and to scale up when serving to guests, this meal is ALWAYS a big hit. 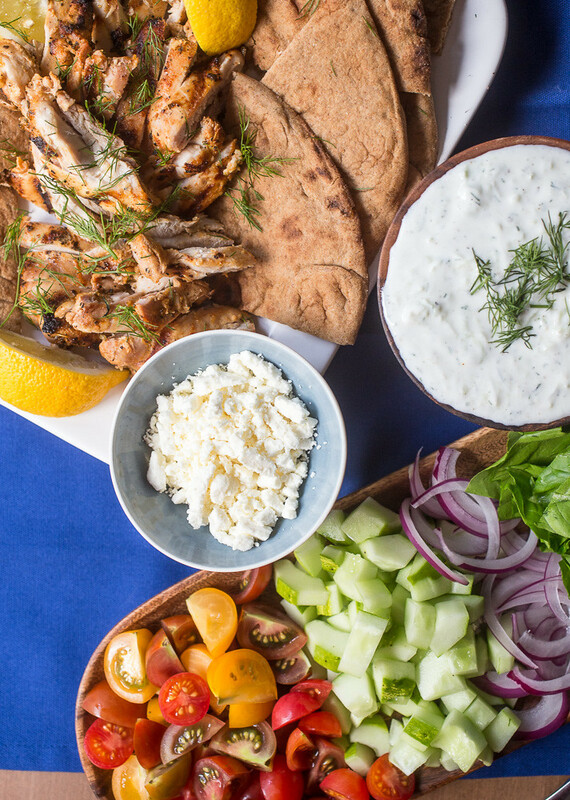 The marinated Greek grilled chicken is so so good and when paired with fresh chopped veggies, creamy garlic cucumber sauce (tzatziki), and some whole wheat pita, you’ve got yourself a super healthy and creative summer meal too! 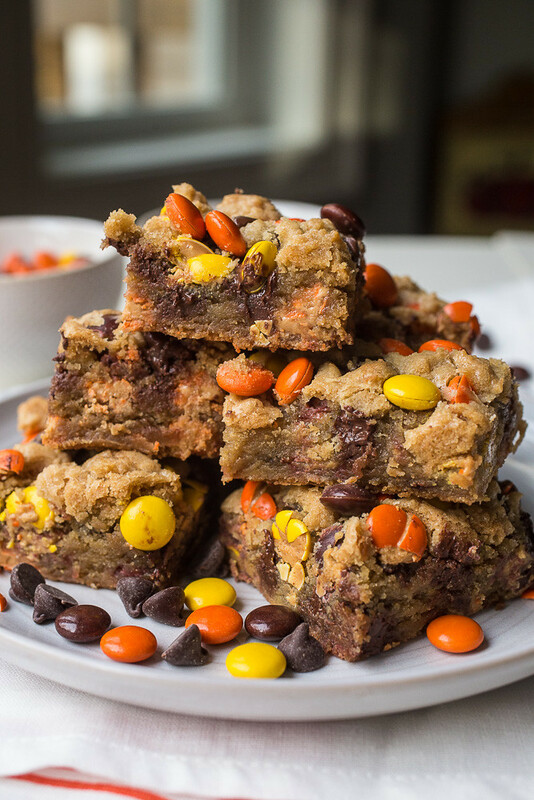 Peanut butter cookie bars by Smells Like Home: OK, so we all know the drill about how much everyone loves chocolate chip cookies but when you mix Reese’s Pieces into the dough and throw the dough into a brownie pan to bake into cookie bars, you’ll literally watch these peanut butter cookie bars disappear the second you serve them. These cookie bars are INSANE. we love to see what you make! tag what you make with #smellslikehomeblog on Instagram and follow along with me in my New England kitchen! What a great plan! I love quick meals. Thanks for sharing my taco recipe! You’re so welcome! Thanks for the great recipe! !